Dr. Elice is excited to inform you of a new nutritional product called SpectrumNeeds™ that just became available and may prove beneficial for your child. 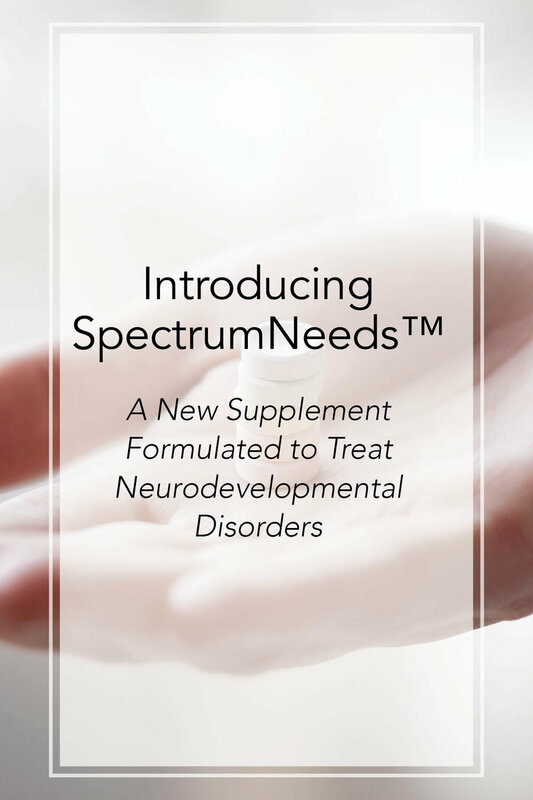 SpectrumNeeds™ is a blend of 33 active ingredients designed for patients of any age with neurodevelopmental disorders, whether mitochondrial disease/ dysfunction-related or otherwise, and whether the child (or adult) is technically on or off the "autistic spectrum", including ADHD. As many of you are aware, autism and related conditions are NOT a simgle disorder but descriptions of abilities and behaviors that have many contributing factors which differ in each patient. Abnormalities in several bioligical pathways can, often in combination, lead to these conditions. Many of these pathways are, in part, treatable by a nutritional approach, including mitochondrial function, free radical defenses, fatty acid and organic acid metabolic detoxification, methylation, and neurotransmitter function. This new powder-mix, SpectrumNeeds™, has 33 active ingredients that address each of these pathways, among others. The product was designed by Dr. Richard Boles, in collaboration with many physicians and scientists, including Dr. Richard Frye, Dr. Dan Rossignol, Dr. Michael Elice, and Dr. Bruce Ames, using the latest in medical and scientific research, the findings of recent genetic testing, and in listening to families and physicians across the continent regarding what they found helpful in unlocking the mind in children and adults with neurodevelopmental conditions. Constitute an excellent broad basis of essential micro-nutrition. Generate essential cofactors, such as coenzyme A. Provide strong antioxidant support for free radical removal. Remove harmful metabolites, including certain oranic acids. Enhance methylation needs, and thereby assist in gene regulation. Facilitate selected neurotransmission, including GABA rceptors. Assist in regulation of insulin control. Improve small vessel circulation in the brain. Powerful because it is a high-quality blend of 33 active ingredients. When appropriate, ingredients are present as active cofactors and/ or at high dosing. Easy-to-Use because all of the ingredients are in a serving of poweder that can be mixed with any beverage. Simple and accurate dosing is based on your child's weight. Affordable because by covering many nutrients likely alreday aupplemented separately, many families will save money overall. Loved by Kids because the nutrients mix well into your child's favorite beverage. Taste tests have been quite positive, including in Dr. Boles' own pernickety children. Safe to Use because it is free of artificial sweeteners, gluten, casein, soy, nuts, and other common allergens. Also, combining products leads to less fillers which is easier on the stomach. More information about the product, including why every one of the ingredients is present in the product, is available on the website as well. SpectrumNeeds™ is designed to offer a safe and comprehensive approach to nutrition as a part of a core therapeutic treatment for patients with autism and other neurodevelopmental disorders. However, no product can do everything for everyone. Thank you for inquiring about SpectrumNeeds™ for your child. Someone from our office will be in touch to discuss your options shortly. What about in individuals with mitochondrial disease without a neurodevelopmental disorder? While not generally autistic, many "mito" patients actually do have a neurodevelopmental disorder, such as ADHD, slow processing, episodes of regression, etc. Furthermore, common disorders such as anxiety and depression often seen in mito patients are related in terms of mechanisms. For all of these patients, SpectrumNeeds™ is appropriate. The ingredients in SpectrumNeeds™ that are not components of the mito cocktail are present in the product due to being neuroprotective and/or components of comprehensive nutrition. Both are goods reasons for supplementation in mito patients. None of the 33 ingredients pose a general risk in patients with mitochondrial disease/ dysfunction. SpectrumNeeds™ by itself cannot completely substitute for the mito cocktail. Most patients will need additional supplementation, especially with coenzyme Q10. Please contact our office directly with questions regarding if and how SpectrumNeeds™ may be appropriate in the management of your child's disease, or of your own disease. Disclosure: Dr. Elice is a Consultant of NeuroNeeds LLC, the company that makes SpectrumNeeds™, in order to assist them to develop better products for people like your child. In this role, he does receive a small amount of money to compensate for his time and expertise. However, Dr. Elice is not compensated more if you buy this product. In addition to buying SpectrumNeeds™ on the website, you have the option of purchasing it in our office. In that case, the practice does receive a modest price mark-up. Dr. Elice's primary interest herein is as your child's physician. You are under no obligation to purchase this or any product, whether recommended by myself or another health care provider.